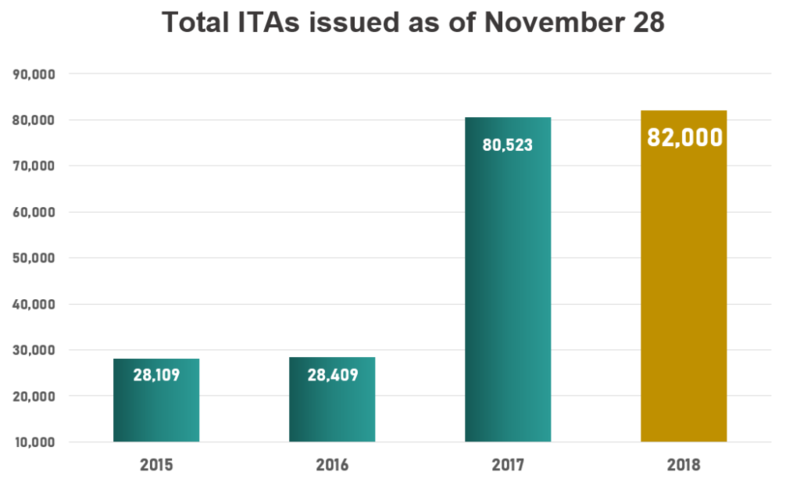 Express Entry Draw released on November 28, has now crossed the number of invitations sent in the meantime a year ago November 2017. Past record set for express entry draw shows that in the year of 2017 total number of invitations 86,023 was sent. In the latest draw 3,900 invitations were issued by the Canadian government and as total it can be counted as the total number of 82,000 invitations released in the year 2018. This time the minimum CRS score was at 445 which is 4 less than the CRS of the previous draw i.e 449. IRCC says that they are only 4,024 ITAs away from breaking last year’s record. This draw occurred less than two weeks after the previous draw which is likely favorable to the candidates who are falling under this score 445 or above that. The less time lapse in releasing out the draws the same effect comes on the CRS scores. If we compare the November 15 draw, it took more than 2 weeks to declare out the draw results and simultaneously score was higher 449. If the draw releases out fast then there will be only fewer candidates can apply but if the draw does take more time then there is a possibility of more candidates to take part in. Where to Apply For Express Entry Draw? I am interested to migrate to Canada.